“GigaLuna” (“Giga” is Italian for “jig.”) 12″ x 8″ altered book, wallpiece. Paper collage applied to discarded books, finished with polyurethane varnish. Hanger fixed on back. $185.00. 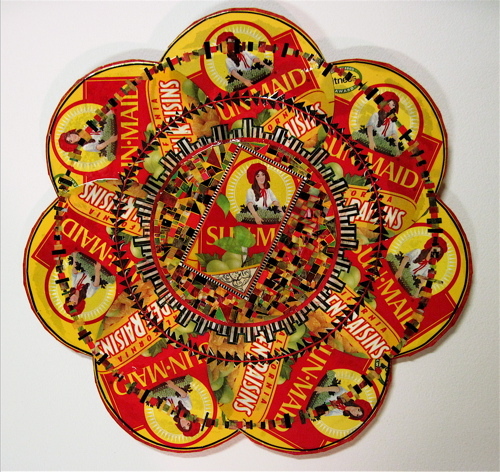 “The Gracious Circle.” Exhibit of mandalas in the Side Gallery of the Jung Center, Houston, Texas, January 5 – 29, 2011. Opening reception Saturday, January 8, 5:00 – 8:00 p.m. Jung Center, 5200 Montrose Blvd., Houston, TX 77006. http://www.junghouston.org; 713-524-8253. Virginia Festival of the Book, Annual Vendors Book Fair. Saturday, March 19, 2011, 9:00 a.m. – 4:00 p.m. Omni Charlottesville Hotel Atrium and Meeting Rooms, 235 W. Main St., Downtown Mall, Charlottesville, VA 22902. For more information visit http://www.vabook.org. Group show at Gallery 549, Lafayette, Louisiana. April 2011. 549 Jefferson Street, Lafayette, Louisiana. Open weekdays, 1:00 – 4:00 p.m., by appointment, and monthly during Second Saturday Artwalk (second Saturday of each month, from 5:30 – 8:00 p.m.) For more information, and precise gallery hours, call 337-593-0796. United Bank Bloomin’ Wine Fest, Winchester, Virginia, April 15, 16, 2011. www.thebloom.com. Flint Art Fair, Flint, Michigan. June 11, 12, 2011. Presented by the Friends of Modern Art at the Flint Institute of Art. www.flintartfair.org. Wyandotte Street Art Fair, July 13-16 (Wed – Sat), 2011, 10:00 a.m. – 9:00 p.m. daily near intersection of Biddle and Maple Avenues, Wyandotte, Michigan. For more information visit http://www.wyandottestreetartfair.org. 16th Annual Crafts at the Cathedral, New York City. December 2-4, 2011. Sponsored by the Congregation of St. Saviour, The Cathedral Church of St. John the Divine, 1047 Amsterdam Ave., New York, NY. www.craftsatthecathedral.com. Deborah O'Keeffe, "Penelope Weaves." Mosaic paper collage on wood, finished with multiple coats of polyurethane varnish. Hanger on back. 7.5" w x 5" h.
Deborah O'Keeffe, "Safe." Mosaic paper collage on wood, finished with multiple coats of polyurethane varnish. Hanger on back. 5.5" w x 4" h.
Deborah O'Keeffe, "The Rainbow Rises." Paper collage, asemic writing, on wood, finished with multiple coats of polyurethane varnish. Hanger on back. 5.75" w x 12.5" h.
Deborah O'Keeffe, "In Search of the Holy Grail." Mosaic paper collage, asemic writing, on wood, finished with multiple coats of polyurethane varnish. Hanger on back. 7.25" w x 11.5" h.
Deborah O'Keeffe, "Plantibius Paradisius." Mosaic paper collage, asemic writing, on wood, finished with multiple coats of polyurethane varnish. Hanger on back. 3.5" w x 13" h.
Deborah O'Keeffe, "Persephone's Ring." Mosaic paper collage, asemic writing, on wood, finished with multiple coats of polyurethane varnish. Hanger on back. 7.5" diameter.